Intermec - Printer, Portable, 4"
The Intermec PW40 thermal workboard printer is designed specifically to hold the Intermec 700 Series Mobile Computer. With a design that is both durable and weather resistant, the PW40 can take the punishment of daily work environments and is easily incorporated into the field. In addition, its functional design makes paper loading simple because roll-type paper fits easily into place. The reliable four inch thermal printer mechanism on the PW40 offers exceptional print clarity with the versatility of printing text, graphics and logos. 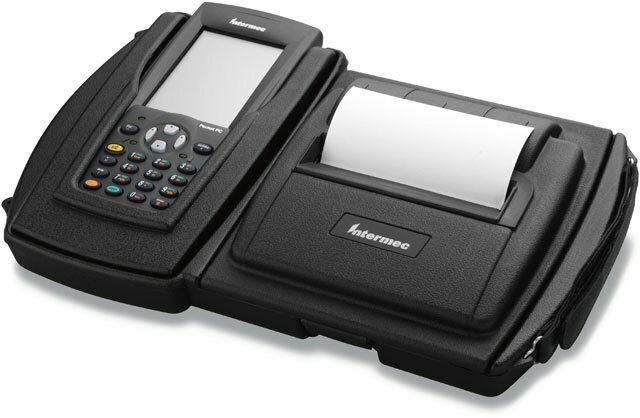 It can quickly print standard 40-column receipts, yet provides users with a 4-inch paper width capability to accommodate compressed 80-column formats. With the flexibility to provide a compressed 80-column receipt, the field worker is relieved of having to carry the bulk of a larger 80-column printer. The PW40 easily handles 120 feet of thermal paper, reducing the frequency of changing paper rolls. 4.094" x 500' Black Resin Ribbon, Compatible with Industrial printers and Polyester Labels, Rolls per Case: 24, Core Size: 1"
The Intermec PW40B00000 is also known as Intermec Technologies	INT-PW40B00000	.